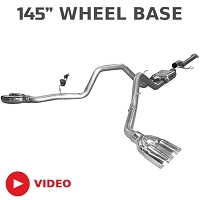 The Borla S-Type "Stinger" exhaust systems are some of the most famous exhaust components on the planet, and you definitely don't want to miss out on the S-Type cat-back kit for your F150 5.0L. Each of these awesome exhaust systems generate a massive, deep roar that you'll instantly recognize when you step on the throttle. 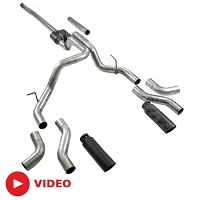 The 5.0L F150 S-Type cat-back kit adds a new sound, horsepower, and torque to your truck with its high-quality, mandrel-bent tubing and high-flow mufflers to make it one of the most effective systems on the market for the Coyote-Powered F150s. The Borla S-Type is Borla's most popular cat-back option, sitting somewhere between the quieter Touring cat-back system and the aggressively loud ATAK cat-back kits. 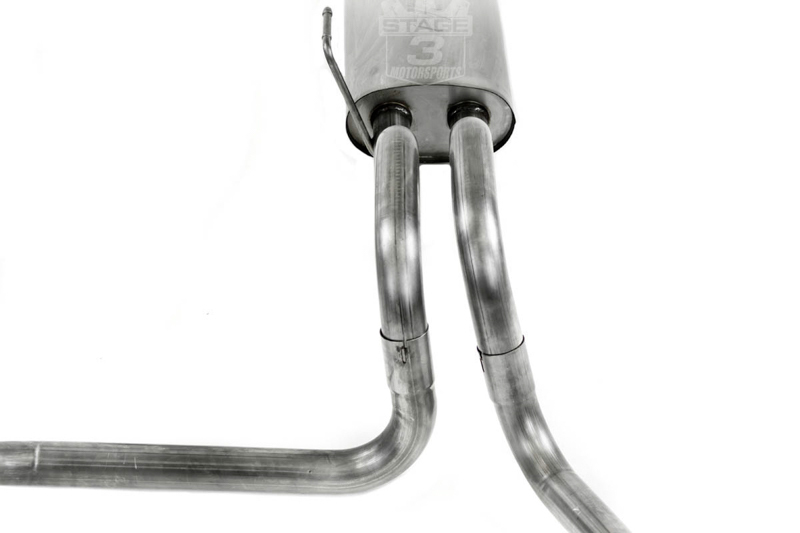 The S-Type mufflers have a unique straight-through design that helps improve exhaust outflow over stock and are finely tuned to deliver a deep, loud roar that does your truck's 5.0L V8 more justice than your factory cat-back. The kit features a split-exit design with large, 4" angle-cut tips that give your truck a great look, on top of improved sound. 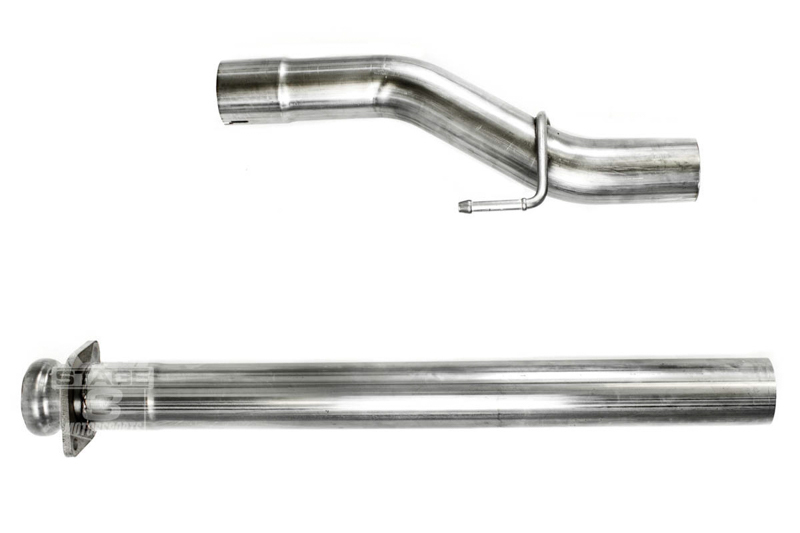 Borla doesn't hold back when it comes to manufacturing their exhaust kits, which is why their systems are often considered some of the best in the business. 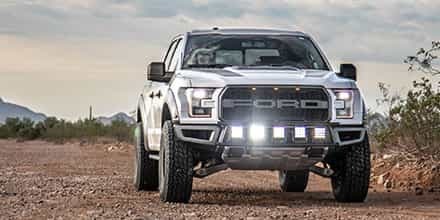 All of Borla's F150 S-Type kits are made out of 300-series austenitic stainless steel that's highly resistant to corrosion and discoloration which makes them excellent in practically any climate. 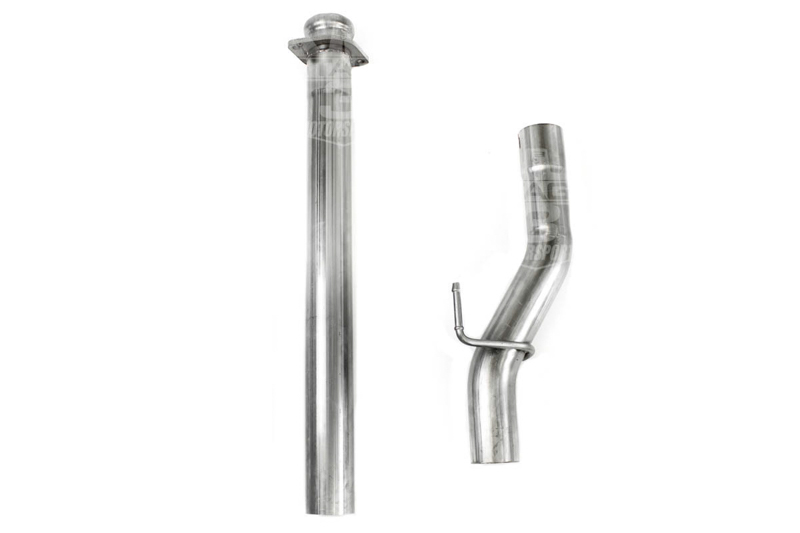 All of the tubing is put into its proper shape through a computer-controlled CNC mandrel-bending process that ensures perfect fitment for every kit. Borla builds all of their exhaust systems right here in the USA and backs each of their kits with a Million Mile Limited Warranty. Wheelbase Fitment: 2011-2014 F150 5.0L V8. This Borla Cat-Back kit will bolt-on to trucks with a 145" wheelbase (Standard Cab w/ 8' Bed, SuperCab w/ 6.5' Bed, and SuperCrew w/ 5.5' Bed). All other wheelbases will require modifications to this kit for proper fitment. Call 1-877-578-2433 for more information. 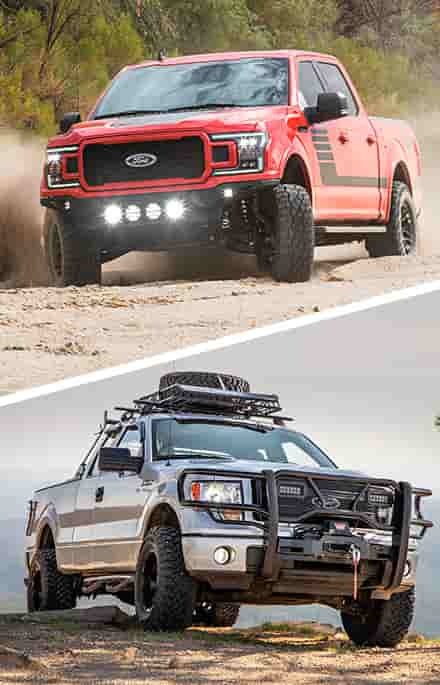 Check out our install guide of this cat-back kit on our 2012 F150 5.0L Project Truck! UPDATE 10-1-2014: Borla has recently updated these kits. 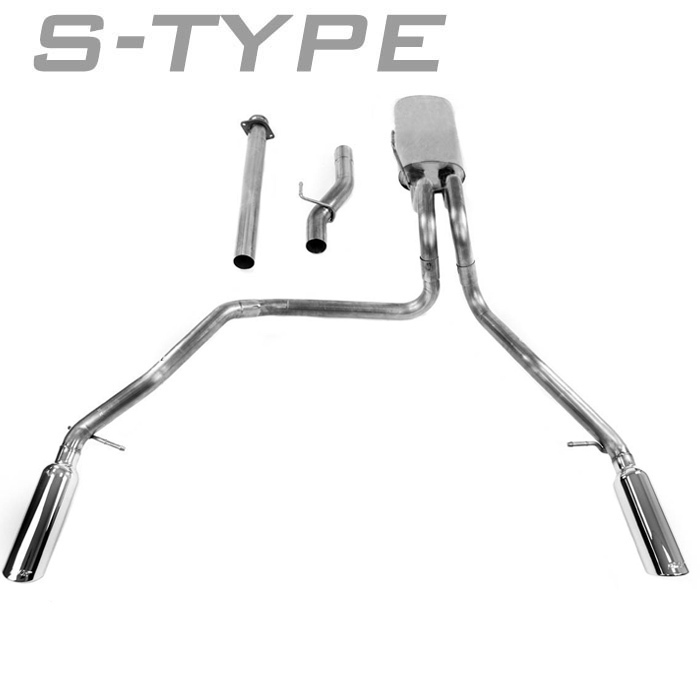 The S-Type cat-back kits now come with a muffler and a Borla resonator assembly, instead of just a muffler and resonator delete. New images will be forthcoming. This is the exact system I had been looking for. A nice sound that lets you know there's 'something' under the hood. No highway drone. You can have a normal conversation. I turn the radio off just to listen. Makes you feel good. The instructions were pretty good but this is a more 'hands on, study the system' type of installation. You should do this on a lift. The stock system came off in 1 piece. Make sure you lube all the rubber mounts. The right side goes on nicely and lines up perfect with a 'fingers' worth of space below the bumper. The left side is tricky as there are two pieces to twist and turn in order to line up exactly with the right side. Take the time and it will come out perfect. The quality and manufacture of a BORLA system is impeccable. Well worth the money and the money was well spent @ STAGE 3. Best price anywhere and excellent shipping. 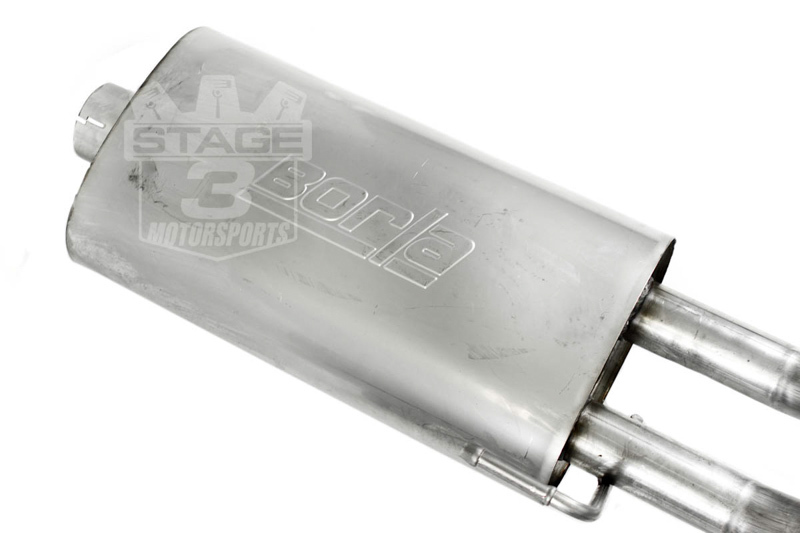 If you have a vehicle you're going to keep a few years, invest in a BORLA system and do it @ STAGE 3. Thanks to all. First rate fit, and quality.Fit and finish is impeccable. Wish this had been the first system I put on this truck, instead of the Roush drone factory this system replaced. An additional feature, if the S type isn't quite the sound you're after, just replace the resonator with a replacement pipe. 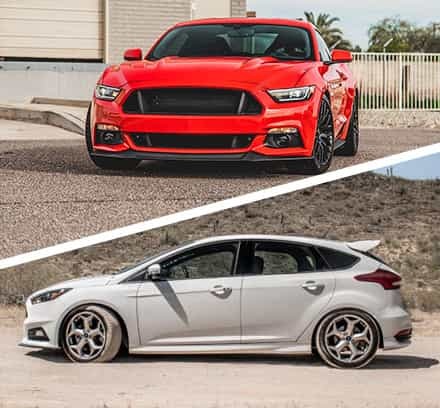 I suspect the sound level will increase a bit once the system has been in use for a couple thousand miles, and that's fine, my biggest complaint was drone with the Roush. I have ZERO drone with the Borla, just a nice gurgle at around 1750 rpms steady speed. The only two things I'd like to mention, just my own taste though. 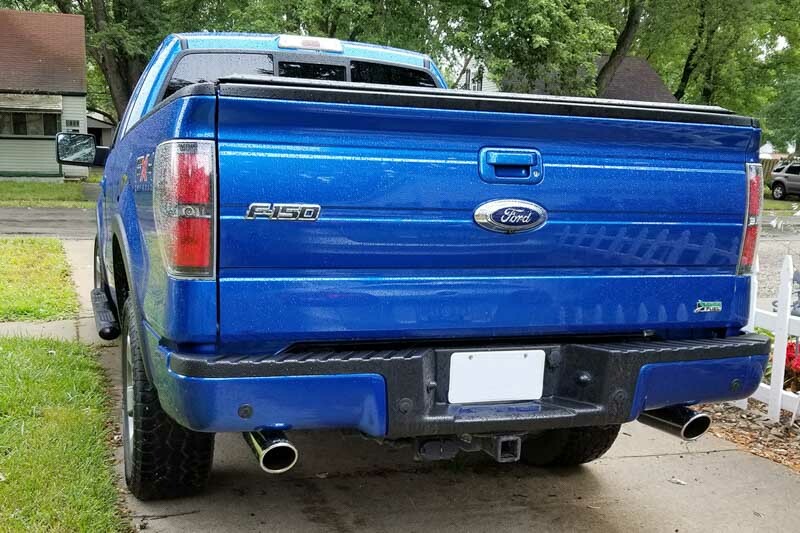 The crossover from the right to left tailpipe seems to hang just a bit low, and is visible from the rear of the truck, not a big deal, some hitemp black paint took care of that, my truck is lifted slightly, so that may be the reason there. The second thing, again my taste, would be to have the tips extend under the truck a little further. I always liked the look of the old Fox body Mustang with the 5.0. And that would have added to the look. I'd recommend this system to any other olde gearhead, nice sound at idle, somewhat quiet, but still audible, but get on it, and you WILL hear it!!! 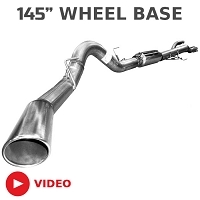 Borla S-Type Cat-back Exhaust System, fit my truck like a glove. The material is of very good quality, one thing I was surprise at was this model comes with the resonator whish is not picture on this web site. The resonator mellows the sound quit a bit almost to the point of stock, unless you get hard on the throttle. I could order the striate pipe but then that be the Borla ATAK Cat-back Exhaust System which is cheaper. But in the end I'm satisfied with the over all system. System is nicely made, fits perfectly and looks great. System is a bit too quiet for my liking when at idle or cruising along. However, it does sound great when you get on it. Stage 3 is a terrific vendor. I received a great deal on my exhaust and it arrived at my house in two days. 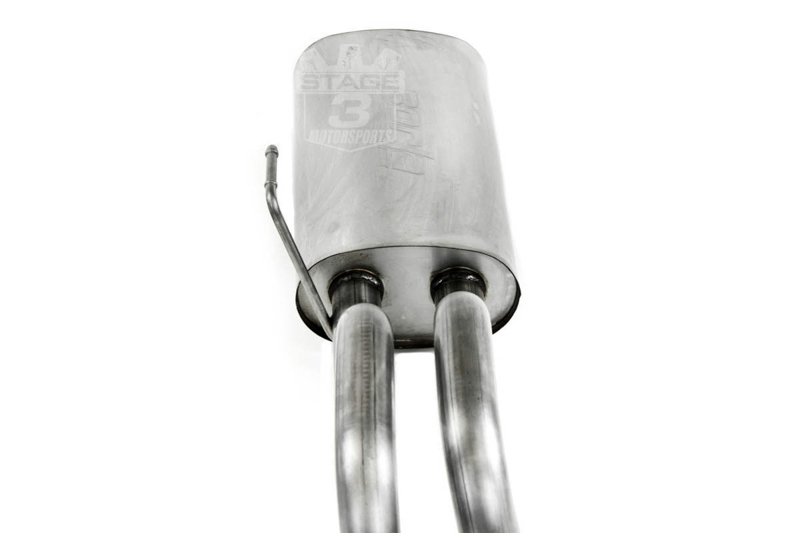 I wanted to award Stage 3 my business due to their effort in putting up all the F150 exhaust clips on YouTube, it was extremely helpful in my decision to by the 140416 kit. The good: I didn't expect any power gains, but I really feel like my truck is quicker and has better throttle response. I used to get a slight surge whenever the RPM's climbed through ~1,500-1,800, but with the Borla, it is gone. The truck is way more fun to drive. The fit and finish of the kit is great, and the tone is unbelievable. I found the ATAK to sound too raspy on YouTube, but the s-type is perfect. The bad: I expected more volume. The s-type on my F150 is much quieter than the s-type on my friends 5.3 Silverado. Inside the cabin, it might be 10% louder than stock. Outside, I'd say it's 20-30%. But the tone is perfect. Also, I was disappointed to find that Borla included the wrong hangers for the tailpipes. I had to run to the hardware store and fabricate my own adapters to get the kit installed. Borla did ship out the correct hangers priority overnight, however, and they were swapped in without issue. Overall, I have to give the kit 5 stars. It's a different truck now, gets me excited to commute in the morning. Took about two hours to install with two people. did not have access to a lift, but backed the truck up on ramps and used a jack on the right side to gain enough clearance to remove the factory exhaust in one piece. Instructions are fairly straight forward. Sound is what I would call the ultimate adult system sounds good at start up and when pulling out from a stop, but quiet at cruising speed. Could whisper a conversation with windows up at 75 mph. Looks and sounds great, gives that nice deep tone you want when accerlating, but nice and quiet at 80 mph on the highway. Really really happy. This kit does not require you to remove your spare tire. It can stay installed in the stock location. Actually, none of the Borla's exhuast systems require you to remove the spare tire. As we've come to find out, the previous answer to your question was incorrect. 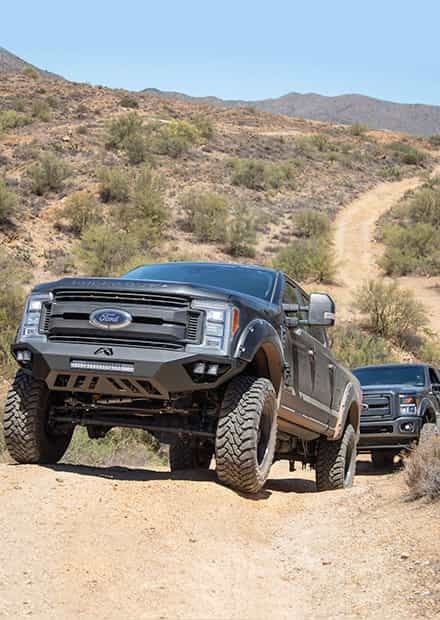 Borla's cat-back kits will only bolt on to trucks with a 145" wheelbase. Longer wheelbases will require extension pipes, and shorter wheelbases will require cutting and possibly other modifications. Call us at 1-877-578-2433 for more information. Was this answer helpful? 2 of 4 Found Helpful. does this system give any drone? or would i be better off with the corsa system? 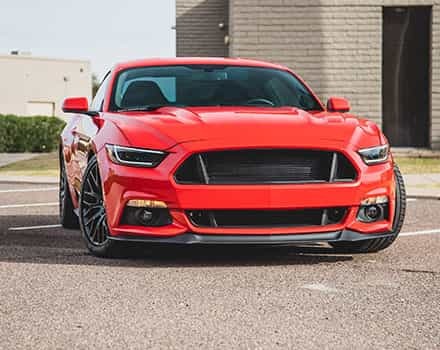 There's maybe a little, itty-bitty, tiny bit of noise at cruising, but it's barely noticeable, especially in comparison to the ATAK or some of the other 5.0L Exhaust Kits out there. 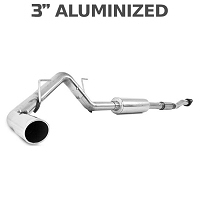 Does this exhaust come with the Atak muffler or the s type? 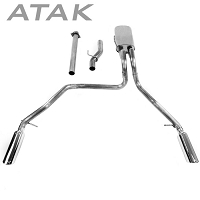 The kit now includes an ATAK muffler and a separate forward resonator assembly, instead of just an S-Type muffler. Borla does not currently offer an out-of-the-box S-Type kit with a dual side exit. Was this answer helpful? 1 of 3 Found Helpful. Will adding 12" of pipe forward of the muffler be all the modification needed to fit a 157 wb or will it need to be modified further back? I can't guarantee that's the only change that you would need. 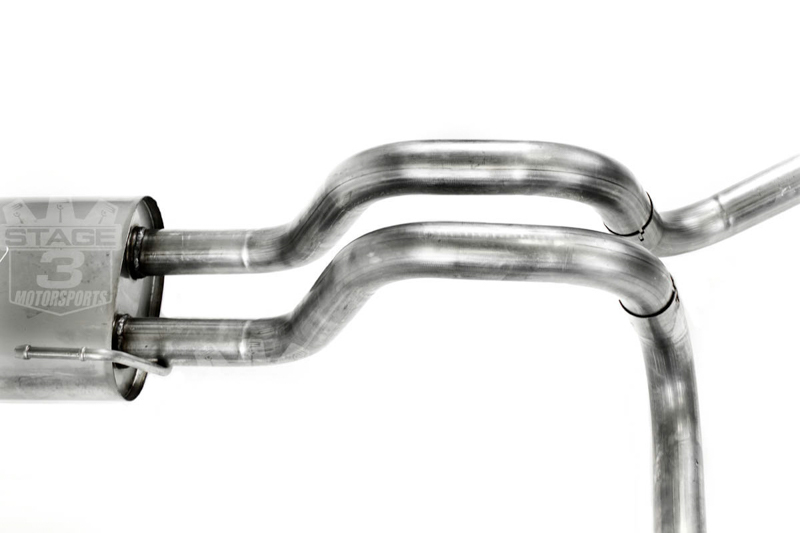 It's possible that some of the tubing would need to be rerouted as it goes over the axle or that the driver's side hangar for the driver's tailpipe may need to be modified or relocated. 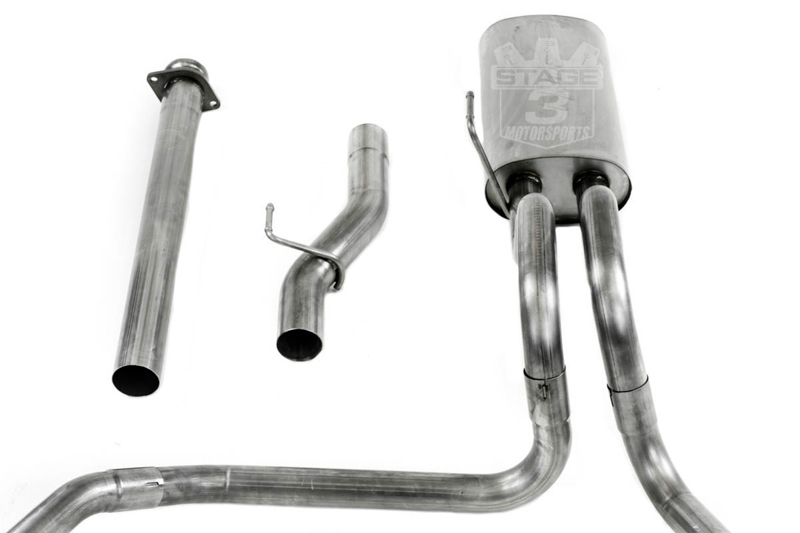 However, a halfway decent exhaust shop that can work with 304 stainless steel should be able to do the job. I was wanting to know what parts are included in this package. Bolts? Nuts? 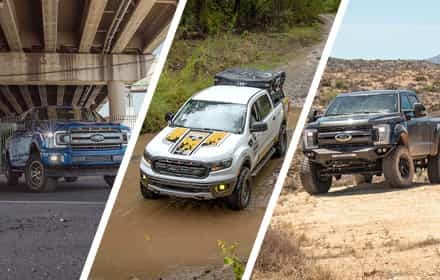 The kit includes new M10 bolts and nuts for the mid-pipe connection, driver's side tailpipe hangar, accuseal clamps, and the actual core exhaust components. Well, the S-Type will be a bit quieter than your current Solo MR400/MACH46 4" System, but it's still a good bit louder than stock, though drone is pretty low, even after some drive time. 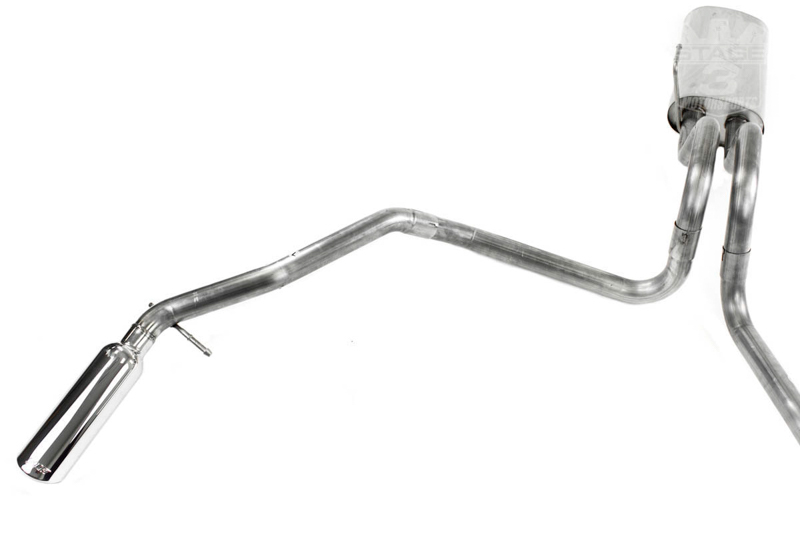 That being said, a more cost-effective solution would be to see if a local exhaust shop could cut and weld in an additional resonator to quiet your Solo kit down a bit, though the S-Type kit is still a good choice. So this kit DOES include a resonator, correct? 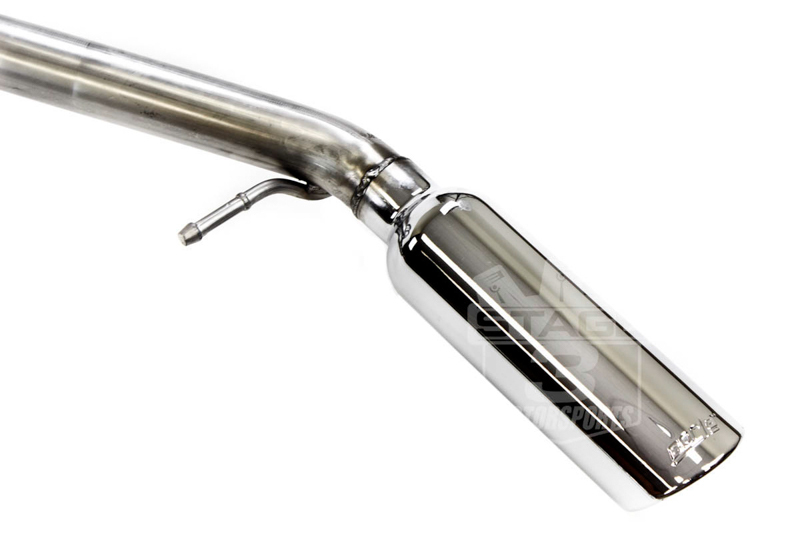 In the past, it was the s Type muffler without resonator, but now it’s the ATAK muffler with resonator? Has that altered the sound or is it the same sound as in the stage 3 video clips? I just don’t want anything too loud. 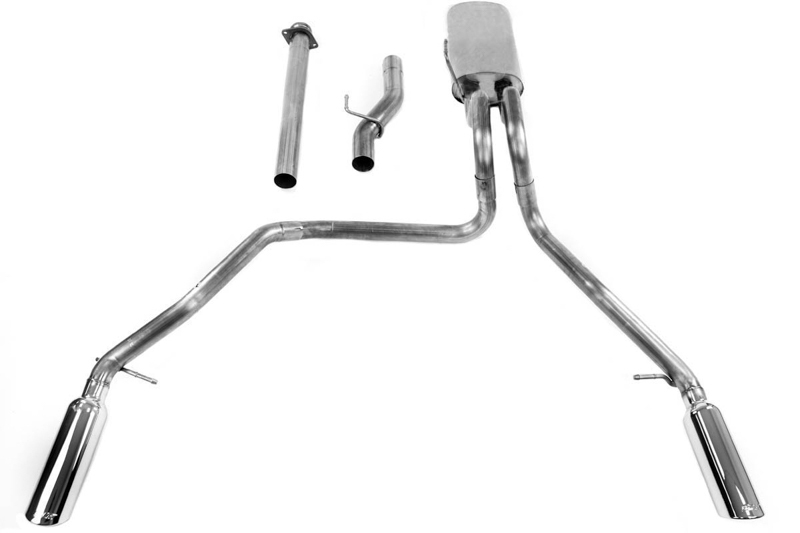 This cat-back kit does include a resonator and an ATAK muffler. The overall sound is still pretty similar to the original version of the kit.